Exclusive in all the right ways—every country club should be so luxurious. This is one hotel that keeps its eye on the ball. The Diplomat Country Club is about three things: golf, tennis, and absolute comfort. 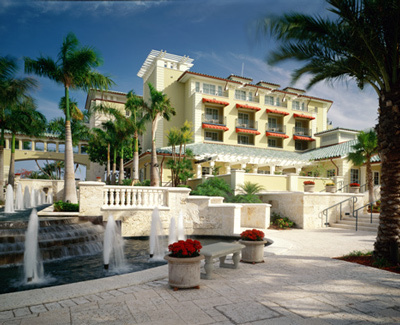 Its 60 plushly furnished rooms and suites, endowed with executive perks such as speakerphones and fax/copiers and spacious bathrooms with marble walls and dual-head showers, are tucked into a pale yellow mansion overlooking flagstone terraces, splashing fountains, and a highly manicured golf course. Although it's just across the Intracoastal Waterway from its high-rise sister the Westin Diplomat Resort, this hotel seems a world away with its quiet, clubby atmosphere. Every conceivable service is provided to put you on top of your game, from equipment rental to resident golf and tennis pros. You may want to loosen up on the driving range or putting green before tackling the golf course, which offers an immediate challenge with its island second hole—and if you need a refresher to help you finish the round, order up drinks and even food right on the course via the GPS system in your golf cart. Looking for a tennis partner, or need your racket restrung? Just ask the tennis center staff to arrange it. Whatever pastime you pursue, don't pass up the chance to treat yourself to a dose of bone-melting relaxation in the fabulous spa, whether it's a stone or sports massage, an aloe-mint body wrap, or an aromatherapy facial and orange-peel manicure. Just the rejuvenation you need for tomorrow's early tee time or tennis round-robin—or to dine and dance under the bright lights of Fort Lauderdale or Miami, mere minutes away for those who like to play by night, too.